A very long time ago I was asked to speak to a Christian women’s conference in North Carolina. The name was Women of the Word. I was somewhat nervous because I was not sure what a Women of the Word Conference would be like. Would I measure up to the standard expected of me? Would the conference measure up to the name? Well, many years have come and gone, and I am still a part of Women of the Word. It is my privilege to serve as pastoral advisor to this ministry and to minister at their conferences. It is a blessing to call myself a Woman of the Word. 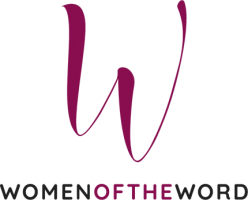 What I appreciate about Women of the Word is that this ministry lives up to the name. This ministry is led by women who live by the word of God. Prayer is a part of the ministry, and the prayer is made to insure that God’s will is done. The messages preached during conferences are not religious sermons. The messages are from women who impart to all in attendance how God has worked to bring them to fulfillment. From the opening prayer of a conference to the closing prayer the Holy Spirit is present. Women are born again, filled with the Holy Spirit, healed, delivered, etc. The moving of the Holy Spirit touches every one present. The best thing about Women of the Word is that friendships and fellowship extends beyond the conference settings. My oldest son was in a car accident and in a critical and hopeless condition. My husband and I called those we knew would pray in faith with us. Betsy Roy, the director and leader of Women Of The Word, was one we called. She and the intercessors of Women Of The Word prayed with us, and God did a miracle. Our son is alive and well today. I can testify that Women of the Word produces in a woman’s life what it advertises it will do. The test of any advertisement is whether or not what is advertised does what it’s name says it will do. My life is changed for the better because of Women of the Word. The women I have met through Women of the Word are a part of my life’s story. The Holy Spirit has made me a woman who really does live by the Word of God. Why not check us out? When you do, expect your life to be transformed. What woman would turn down an eternal life changing transformation. See you at the next conference. Take it from me you do not want to miss it. I love the beginning of each session of a WOW Conference! Entering the ballroom, we sense the excitement in the ebb and flow of conversation as women greet each other. The atmosphere is already charged with the anticipation of the glorious praise and worship led by Sandy Grant Childress. Then we begin…prayer opens the portals of heaven, worship fills our thirsty souls, and joy fills our hearts. The dance team, Envision Dance Troupe, blesses us with their beautiful ministry to the Lord. The speakers, June Capps Evans, Barbara Wells Benton, Dr. Lynn Lucas, and Dr. Sherry Gaither, share the anointed Word of God, which both delights and challenges us. The sound of laughter ripples through the room like a wave we just have to catch! Periods of silence envelop us as a holy awe fills the room with the realization of Who is present and moving among us healing broken hearts and troubled minds. 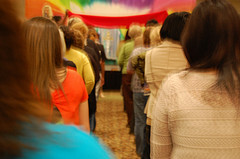 We close each session with prayer…ministering the love of God to so many women. Why do I love Women of the Word conferences? It is not just an event; it is an encounter with my Lord Jesus, the Love of my Life. You are invited to come to the Spring WOW April 10 – 12 in Portland, Maine. We are nearing capacity but some seats are available. Register today online or walk-ins accepted. Click for Conference Schedule. More information at www.women-of-the-word.net.